This review of The 100 Day Challenge includes an interview with the creator, Gary Ryan Blair, as well as details on the features, the pros, and the cons. I am big on goals. Big goals. Set, achieve, repeat. This approach has allowed me to have some major breakthroughs in life. 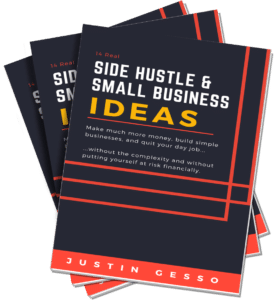 It allowed me to quit my six-figure job and design a life around what I wanted, making money in all sorts of fun and interesting ways. It allowed me to not only publish a book, but publish a bestseller. I continue to set bigger and bigger goals, progressing forward. As part of this though, I need a never-ending supply of inspiration and motivation. It’s not always easy to keep pushing. This is where books, mentors, coaches, success programs, and more come into play. If there’s one thing I’ve realized, it is that I need a constant influx to keep going. The 100 Day Challenge is one of those programs. It will guide you through setting very specific goals to achieve in the next 100 days. It then serves to inspire, motivate, and fuel you through that period. It’s a program I put in my regular rotation and something I recommend to all of my friends. Shortly after starting it, I became intrigued by the concept…I love the specific 100 day aspect. This led me to reach out to the creator, Gary Ryan Blair, and record an interview with him, which you’ll find here as well. And let me be upfront…I partner with the program and will earn a commission if you buy; however, I am doing so for a reason. I could write this review for a lot of programs, but chose this one because of the results I’ve personally seen. I recommend the program to friends, family, and other business partners. I use it personally. And above all, I always operate with integrity and the utmost honesty, so what you’ll find here is a truly transparent review of the program. If you find it’s right for you, that’s excellent. If not, that’s okay too. Let me start out by saying the name is what sold me on this program. It’s such a great concept to challenge yourself to do something outstanding in 100 days and then set out to do it. The simplicity of it really jives well with me. There’s nothing secret here, just a solid goal-setting program based on a great concept. The audio is about 22 minutes long. Who might want to do The 100 Day Challenge? Other area that you want to change or improve. Do you want to write a book? Start a website? Travel the world? I’ve done a lot of coaching programs, including Stephen Covey, Jack Canfield, Brian Buffini, and The Core. Each of these programs have their different takes on things, but fundamentally, they are about achieving what you want in life. These programs can be very expensive and involve live, 1-on-1 coaching. While I believe you will get a return out of these programs if you commit, many people might want a less expensive option. Goal achievement in general is about making noticeable change in your life. So when you look back in a few months, you can truly say “wow, I’ve made some serious improvements.” And when you look back in a few years, you’ve come exceptionally far. If you’re not setting and achieving goals, you may look back and realize your days have blurred together and you’re not living a meaningful life. So if you’ve tried some free programs, are now ready to step up to something better, but not quite yet ready to dive into a major coaching programs, the 100 Day Challenge is probably just right for you. And if you like what you see in the 100 Day Challenge, you can then consider moving on to another program that is a larger investment. 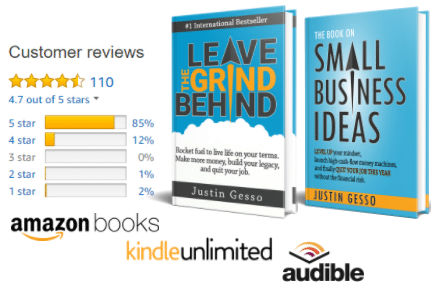 Of course, my top recommendation is that you buy my book “Leave the Grind Behind,” my own #1 international Best Seller, but I assume you’re here to learn about The 100 Day Challenge instead. The 100 Day Challenge is a program that helps you figure out some great, inspiring goals. It then works you through the steps to accomplish them within 100 days. Along the way, you’ll receive information and motivation daily to keep you on track. The program is based on the idea of success being based on knowing what you want to achieve, why you want to achieve it, and how you will get there. The 100 Day Challenge dives into all of these areas in a workbook based manner. Who is the 100 Day Challenge right for? The 100 Day Challenge is right for anyone who wants to change and improve something in their life. Perhaps you need some guidance, motivation, a system, or just some inspiration to get it done. I choose to do the 100 Day Challenge to help define my goals, push myself, stay motivated, and achieve more than I would have otherwise. I also use it to close out my years strong. What are the features of the 100 Day Challenge? The 100 Day Challenge is primarily made up of a detailed workbook that takes you through setting effective, inspiring goals. You will receive short coaching videos every morning to guide you and help keep you on track. There is also a members-only area forum to discuss your progress with other students going through the program at the same time as you. How is the customer service for the 100 Day Challenge? I actually ended up emailing a couple of questions about the program and received and informed response within a day. I don’t have a lot of exposure to their customer service, but my experience was very good. The process for submitting inquiries is right on the home page. What is good about The 100 Day Challenge? To sum up the pros, the 100 Day Challenge is a very low cost goal achievement program. I love the 100 day time frame. To me it’s a perfect span for setting big goals. The workbook is effective and engaging and helps me lay out my thoughts well. I also like that it delivers content to you on a daily basis. If you slip up or take a day off, you get behind. This keeps you on track. The app actually works pretty well. It’s nice to be able to watch the videos on mobile–they’re short. But it really comes down to results. For me, the results have been great. I’ve used the system to achieve numerous big goals and continue to use it. I also know quite a few other people who have used it equally as effectively. What is bad about The 100 Day Challenge? If you cannot keep yourself accountable, you may not do well with this program. More expensive programs include more of a human accountability factor, which drives accountability even higher. While it would be a waste of money, you could conceivably sign up for this program, print the material, and let it collect dust. Personally, I lost interest in some of the daily videos, but I don’t really like video-based content in general. If I’m not reading, I prefer to listen to content while I drive. You do have the ability to listen to the content, but it’s through a specialized app. I might like the option to pay a bit more and receive audio CDs in the mail. Who uses The 100 Day Challenge? Why is The 100 Day Challenge only open a few times per year? There’s a component of marketing to this. Having short registration periods creates scarcity. The community accountability aspect of the program really only works if you have everyone going through at the same time. How much does the 100 Day Challenge cost? As of this writing, it costs $147 as a one time fee. You may also receive a half-off offer for a 2nd license. This worked well for me, because I was able to sign-up my wife. Having someone else do the program with you helps the accountability factor! Is there a money-back guarantee for the 100 Day Challenge? There is indeed a money-back guarantee. If you don’t like it, you get your money back. So not much to lose. How do you get started with The 100 Day Challenge?